I know I haven’t posted for a long time. I’m sorry. I got out of the habit, but I’m trying to get back into it. Today I was thinking about Easter, we are going to have Easter brunch!! I do love brunch. Don’t forget to serve these vegan pancakes with Tempe Sausage and Scrambled Tofu! This is one of the easiest vegan recipes to master, and one that no one will ever know is vegan. This recipe makes 8-10 pancakes depending on how big you are making them. Don’t forget the real maple syrup! Mash banana in a medium bowl. Add flour, baking powder, baking soda, salt, vanilla and 3/4 cup of milk and stir together. If mixture needs more liquid add it to your desired consistency. 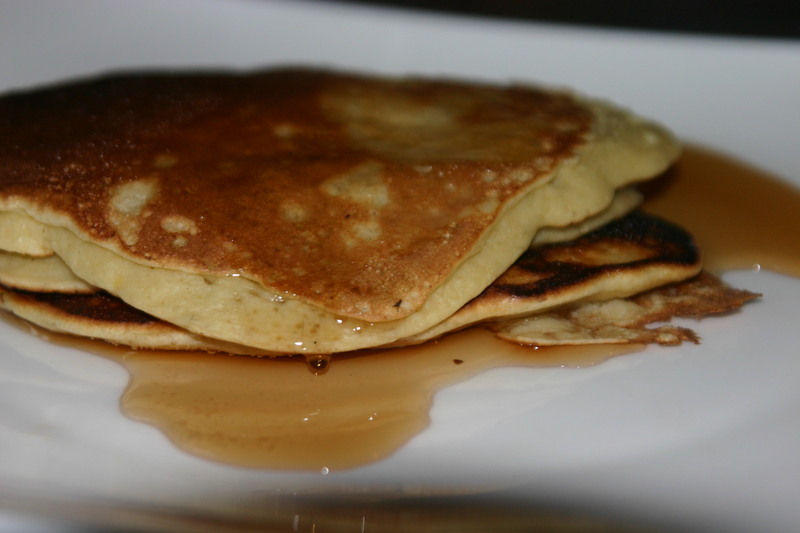 Thicker batter makes thicker pancakes, thinner batter makes thinner pancakes. Stir in any optional additions such as nuts.